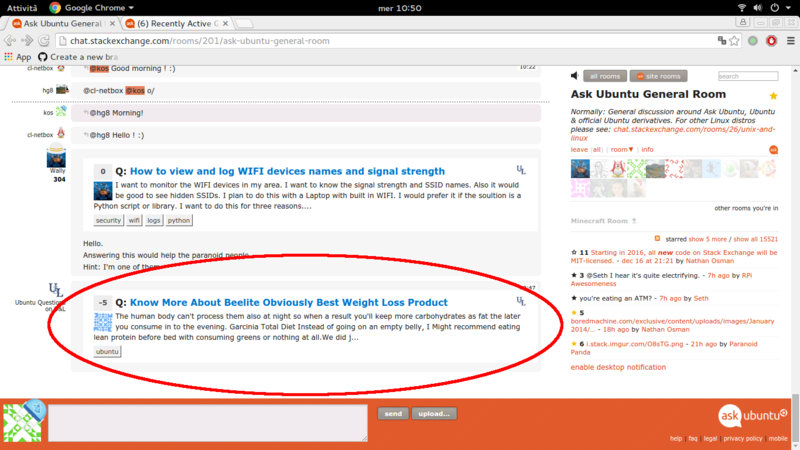 As those who regularily attend the chat may know, new questions posted on Unix & Linux tagged ubuntu are "featured" in the room by Ubuntu Questions on U&L shortly after they've been posted. The problem is that the bot doesn't cater for already deleted questions (and this is a problem expecially for spam / rude or abusive questions). The spam post was deleted at 9:47:58, and the chat post's timestamp is given as "9:47 AM". I guess it was a matter of seconds. I think we can let the bot off the hook, just this once. Not the answer you're looking for? Browse other questions tagged bug chat .